Having reviewed Blue Beetle last week, it's only natural to review Ted's bromance buddy next. While the Ted Kord incarnation of Blue Beetle was created by Steve Ditko back in the 1960s for Charlton Comics and Booster Gold was created for DC Comics by Dan Jurgens 20 years later, the two became famed best friends in the pages of Keith Giffen and J.M. DeMatteis's Justice League International in the late 1980s. Since then, Booster Gold's popularity has waxed, waned and waxed again among DC fans. He's currently starring in his own series. While working security for the Space Museum in the 25th Century, Michael Jon Carter used Rip Hunter's time machine to visit different eras, stealing security robot Skeets, a Legion of Super Heroes flight ring, and Braniac 5's force field belt. With these, he traveled to the 20th century to reinvent himself as a hero, Booster Gold. Currently, Booster patrols the time stream preventing villains from altering the past in order to change the present and future. Booster Gold uses the "buff male" body, the same one used for Batman and Superman. The only new sculpting is the head, forearms, and gloves. 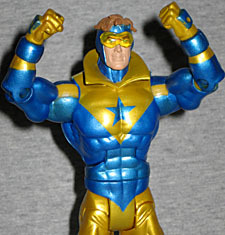 There are actually two versions of this figure available - modern Booster Gold has the costume he's wearing in the comics, more or less, while the "classic" variant has a slightly different paint scheme (no blue on the shoulders) and the addition of a big disco collar. Although the classic version is technically the variant, neither is harder to find than the other. Metallic paint can be very hit-or-miss, but fortunately, Booster's gold appears to be a direct hit. The gold paint actually looks golden, and has a nice sheen to it, making Booster Gold one of the best-looking DCU figures to date. There's one other issue. 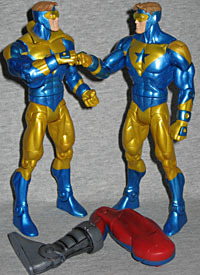 Modern Booster Gold should have blue gloves, not gold ones like the classic variant (and oddly enough, some of the early production figures did have blue gloves). Unfortunately, this appears to be another factory QC error. The gold gloves don't look too bad, and since more fans seem to prefer the classic Booster, it's perhaps not that big a deal, but as someone who usually prefers the modern versions of characters it's annoying (particularly since we know that correct versions were made). I'm not 100% sold on the head sculpt, if only because it looks a bit goofy - and not just because of his half-smirk. The features are a bit smooth and outsized. 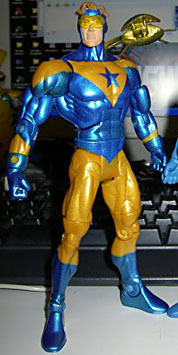 I think this may partially be due to the way the head came out of the mold, but Blue Beetle's head looks better. And his eyes are just swimming behind those goggles. Plus, the paint on the head is a bit sloppy. It's definitely not as sharp as Blue Beetle's. Booster features standard DCU articulation: a balljointed head, balljointed shoulders, hinges at the elbows, knees, ankles and abdomen, swivels at the biceps, wrists, lower thighs and waist, and H-hinges at the hips for balljoint-like movement. The ankles have a good range of rocker motion as well (I still can't figure out why some figures have great rocker ankle range and some have none at all). Aside from his Atom Smasher part - the left leg, appropriately mirroring his buddy Ted's BAF piece - Booster comes with his robot pal, Skeets. To give the impression of floating, Skeets is attached to a yellow translucent peg that plugs into Booster's back, in the standard DCU capehole. When the figures first came out, fans were disappointed to find that some Boosters had the peg glued in place, making Skeets unremovable. Initial reports (ie, word of mouth) said that the classic version was firmly glued into Booster's back, while the modern version came in and out easily, but that's incorrect: apparently whether or not Skeets is glued in is completely random. The Skeetses that come with the two Boosters aren't identical. Although they're both clearly sculpted to resemble the same specific device, they're two unique molds. What's the difference? While classic Skeets is a single solid piece, modern Skeets can be opened to reveal Mr. Mind, Captain Marvel's arch-nemesis. This is a reference to DC's 52 storyline, in which Mr. Mind took over Skeets for a time. It's a neat little bonus, although Mr. Mind's paint applications could certainly be better - mass market paint applications on tiny characters like this are often pretty difficult to do well. For instance, the Four Horsemen sculpted Mr. Mind's little neck-radio, but it isn't painted. Some of the tech detailing inside Skeets is painted, though. Aside from the golden gloves, there is one other QC issue. The peg holding up Skeets is made from soft plastic, causing it to droop over time. Eventually one of the little wings touches Booster's shoulder, and this seems to halt the progression. Of course, every swoosh comes out of the mold differently, so who knows where your Skeets will end up? While the gold gloves and "Skeets droop" are annoying, the figure's overall paint applications, with their metallic sheen, are so well executed that I can't help but find him slightly above average.